After your and many other souls passing in frame, thousands of students have stood up together. I hope their prayers and our candle lights are showing your paths to the next. 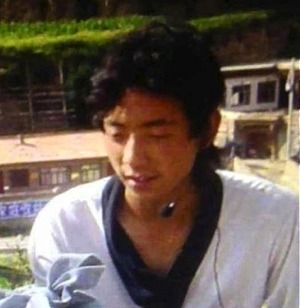 Info: A 19-year old Tibetan who was known as one of the brightest students at his school died after self-immolating in front of a monastery in Tsoe (Chinese: Hezuo) in the Kanlho (Gannan) Tibetan Autonomous Prefecture, Gansu on Saturday (November 10). The death was quickly confirmed by the Chinese state media. Gonpo Tsering, who had married last year, called for freedom for Tibetans, the protection of the Tibetan language, and for the Dalai Lama to be brought back to Tibet. According to Tibetan sources in exile, monks gathered at the scene and tried to extinguish the flames but failed. They took his body back to his village and prayed for him there.